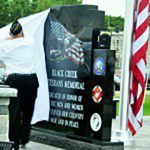 It took 15 years in the making but the Black Creek American Legion Post 332 dedicated the completion of their Black Creek Veterans Memorial. 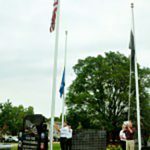 Although completed a few months earlier, a ceremony was held on Saturday, August 26, to unveil the monument to the community. 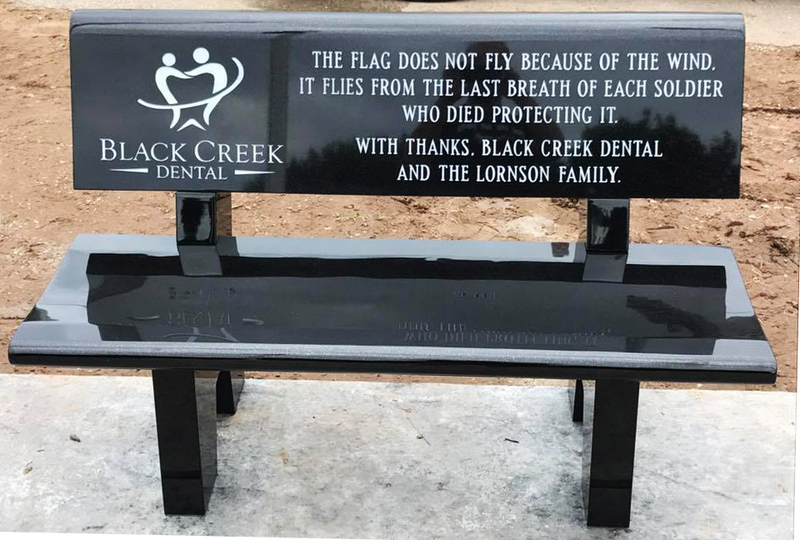 Frank Lindsley, a member of Black Creek American Legion, said a good crowd gathered for a grateful and patriotic duty to dedicate the memorial to those veterans who died in their country’s service. State Vice-Commander Todd Brown everyone needs to pause and think about what a memorial actually is. 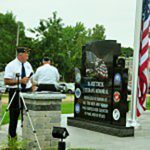 Outagamie County Executive Tom Nelson said everyone has heard of the historic stories of war but unfortunately the same cannot be said for those names on the Veterans wall. “That is why today is so important,” he said. “There sacrifice and their stories are the same as some of the well known stories. That is why it’s so important we have this memorial. “It’s such a wonderful and beautiful reflection on this community and this county.” Pat Amerson, legion member memorial committee member, said the memorial was generated with the hope that future generations will remember the sacrifices of all those veterans. He mentioned the major sponsors and contributors who helped make the memorial possible. “To all, we offer a sincere thanks,” Amerson said. “It’s no surprise what’s under the sheet here but we are going to have an official unveiling.” Flags were then raised to playing of “Colors” by Brady Madison. A 21-gun salute concluded the ceremony.